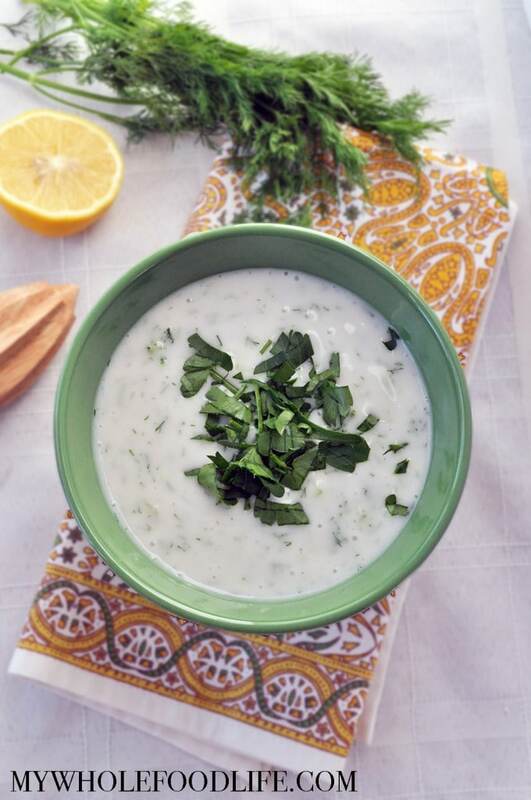 The other day my friend Liz from The Lemon Bowl posted a delicious looking tzatziki sauce. I instantly wanted to try and do a veganized version. That is where this Vegan Tzatziki Sauce came about. Make sure you check out The Lemon Bowl for some awesome, healthy recipes! Traditionally, the recipe calls for yogurt. I made mine with plain coconut yogurt. For those that think the coconut will effect the taste, trust me, it won’t. The flavors of the dill and garlic take over. This dip is great on so many things. Veggie burgers, raw veggies, chips, pita bread, and so much more! This recipe also got the thumbs up from my Turkish mother in law. If you like this, you may also enjoy my dairy free ranch dressing and my dairy free sour cream. If you can’t have any coconut, I bet you could tweak my dairy free sour cream to use in place of the yogurt. Keep refrigerated. This should last about 4-5 days in the fridge. Enjoy! Do you have a favorite brand of coconut yogurt?